Suites Class guests have access to The Private Room, which is accessed via the First Class Lounge. The spaciously colonnaded Private Room boasts thick carpets, a lofty ceiling with velvety seats and plush leather arm chairs as well as floor to ceiling windows offering views of the tarmac. Apart from shower facilities, it also comes with a sit down dining room with an East meets West a la carte menu that features dishes like eggs, dim sum, beef brisket noodles, wanton mee and masala dosai washed down with a full drinks list ranging from juices, tea, coffee, wines, Champagne and spirits. Exclusive to the Singapore Airlines 380-800, the Suites Class cabin designed by French luxury yacht designer, Jean-Jacques Coste, offers 12 private booths. Each private cabin comes with a brown and beige Poltrona Frau leather-crafted seat measuring 58 cm in width and a chaise lounge for companion seating. 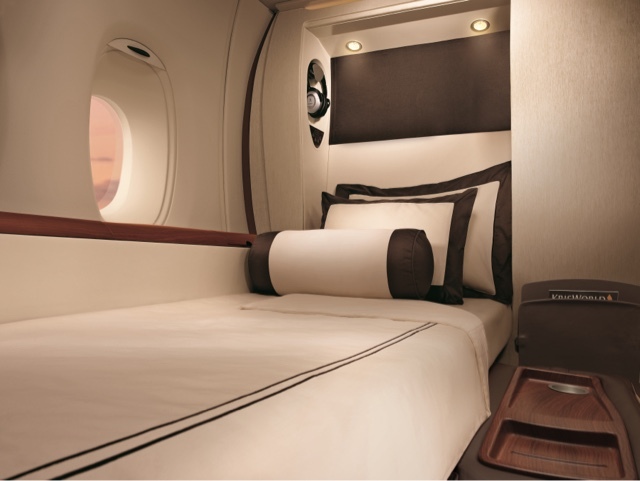 With the assistance of an air steward / stewardess, the seat converts into a 1.98m flat bed with Givenchy-designed duvet and cushions. To ensure that Suite class passengers smell great and are properly rested, each is gifted a set of long-sleeved pyjamas as well as a Ferragamo amenity bag (consisting of F by Salvatore Ferragamo fragrance, a lip balm, hand cream and facial mist). While I appreciate the sleep wear, I can’t help but wish that the Ferragamo fragrance, which I gave to my mother, could be replaced with an essential oil-based wellness brand. Seats wise, each Suite is framed on one side by a little window with an adjustable blind for privacy as well as a set of sliding doors that is not designed to close completely. A Bose headphone is stowed away in a wood panelled side table with fully flushed pullout dining table. Embedded right below the adjustable blind is a wood panelled control pad for privacy selection and lighting; and below it, a pull-out devise for selection of movies, music and seat manipulation. Each cabin also comes with a personal coat closet. 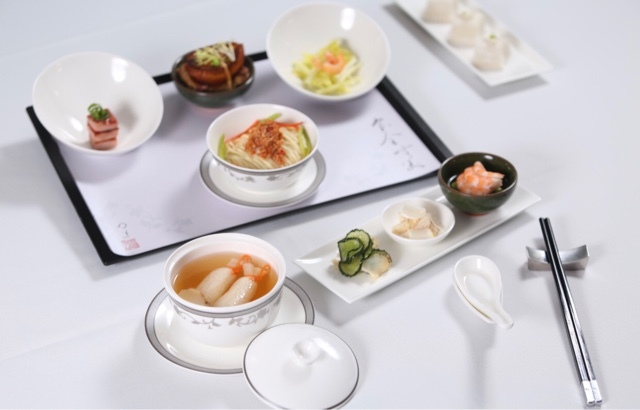 First and Suites class share the same menu curated by Singapore Airlines’ now-waning International Culinary Panel including chefs Yoshihiro Murata and Sanjeev Kapoor. Sadly enough for a made-in-Singapore brand, a quick scan of the chefs featured on the panel reveals none of Singapore’s line-up of great chefs. Perhaps a saving grace to some but yet another let-down for a Singaporean, meals are served on Wedgwood bone china instead of exquisite designed-in-Singapore porcelain like Supermama. Two meals – lunch and snack – were served during my eight-hour flight from Singapore to Melbourne, with a lack-lustre recommended lunch menu curated by Alfred Portale from the United States that included cauliflower panna cotta, celeriac and pear cream soup and seared lamb loin. I opted, instead, for an East-meets-West flexi menu that included “deliciously wholesome” choices and “popular local fare”. To start, I had a luxurious chilled Malossol caviar with Melba toast (appetiser), followed by a wholesome double boiled chicken soup with cordycep flowers (soup) and a salad of arugula, spinach with Kalamata olive in walnut sherry vinegar dressing (salad). For the main dish, I picked Singapore beef noodle soup with sliced beef and salted vegetables (main course) and the meal concluded with an Albert Portale-picked warm frangipani tart with almond ice cream (dessert) and a cheese course. Admittedly the choices were too varied to pair well but I did not want to be cornered into a six-course New American meal. For refreshment, I had a conpoy and seafood congee that was too dense to be enjoyable. None of the courses I had on-board the Suites class was worthy to write home about. If anything, I feel that the culinary product offered by the Singapore Airlines is losing is sheen and has failed to keep up with the times. Service is as detailed and immaculate as can be. Of all the airlines I’ve used in recent years, service on Singapore Airlines still stands out for its graceful guest approach and attention to detail. A glass of Dom Perignon Champagne was served to me upon seating without my asking and the staff showed genuine concern when I failed to drink from the glass. When I commented that I liked my Champagne nicely chilled, the steward served me another glass at lunchtime, this time at almost my desired temperature. For long flights where passengers prefer to rest in between meals, the crew pretty much leave us to it although a staff is always on hand to assist at the pantry or to respond to the button call. KrisWorld offers 100 movies (that’s more than what any one can watch in one seating), more than 180 TV programmes and a library of 700 music CDs as well as 3D games. It also offers a suite of office applications that allow passengers to plug in a USB thumb drive to edit files. The writer was upgraded to Suites Class courtesy of Singapore Airlines. Photos are courtesy of Singapore Airlines.